Today's system of modern roads and thruways owes much to the early patterns of Native-American travel and trade. Across what became known as Pennsylvania a sophisticated artery of trails and pathways that navigated the great river valleys and sloping mountain peaks permitted Natives peoples-Shawnees, Lenapes, Susquehannocks, and those who became known as Iroquois-to move freely across the verdant woodlands. The Great Minquas Path, the Kittanning Trail, the Tulpehocken Trail, and the Warriors Path were but a few of the major and interconnected Native earthen roadways that cleared the movement of peoples in pursuit of game, materials resources, and the spoils of war. Long before white European settlers contested for control of the hinterlands, these rough paths linked Native peoples' settlements and communities, establishing patterns of movement and migration that encouraged both trade and conquest. Frequently these trails were only wide enough for one person to pass at a time. Likely an animal path worn down by the constant movement of game, the Kuskusky Path connected what is now New Castle and Pittsburgh in western Pennsylvania, a distance of less than eighty miles. Part of an integral network of trails that opened the colonial backcountry to human settlement, the path provided entry into the primeval forestlands of the colonial frontier, and helped link the Allegheny River with the Ohio Country to its west. Native peoples and later European-Americans traveled its meandering course across creeks and low hills to an old Indian village that would be renamed New Castle. 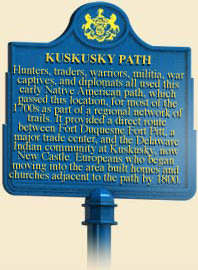 The Kuskusky Path is generally regarded as a continuation of the more substantial Great Shamokin Path that connected Native settlement at Shamokin (Sunbury) on the Susquehanna River with Kittanning along the banks of the Allegheny River. Travelers could move west along the western branch of the Susquehanna and following an irregular course over the mountains to the Allegheny River Valley. It was then an easy trip down river to the convergence with the Monongahela and the Ohio River beyond. By the mid-eighteenth century, an older Indian settlement there had been replaced by first the French Fort Duquesne and then the English Fort Pitt, a de facto recognition of the importance of the site to the entire region of what was then known as the Ohio Country. The Kuskusky Path coursed its way through Indian villages along the Beaver River in present-day Allegheny, Butler, and Lawrence Counties. The name "Kuskusky," or "Kuskuskies," actually referred to a group of four Delaware Indian villages in the area, the most prominent located at what is now New Castle. It was a narrow pathway that moved north through the hills above present day Pittsburgh. In the early 1750s, speculators and land agents like George Washington, and Christopher Gist used the path frequently on their own and official government business. During the French and Indian War (1754-1763), the Kuskusky Path was traveled heavily by militias and Indian allies on both sides of the conflict. In 1758, the Indian village of "Kushkushkee" was the site of a key diplomatic meeting between colonial negotiators and Native leaders, a parley intended to secure Delaware support for English advances on the French Fort Duquesne. The British prohibition against settlement west of the 1763 Proclamation Line, though always difficult to enforce, brought a momentary reprieve from continued white encroachment on Indian lands on the western frontier; however, following the American Revolution and especially the Indian defeat at Fallen Timbers in 1794, the Indian presence in western Pennsylvania all but vanished. Driven out and forced under military force to vacate traditional land holdings, Native peoples disappeared from the Commonwealth within a generation's time. By the early nineteenth century, the Kuskusky Path and other worn trails became the means for a surging wave of western migrants who used Pennsylvania as a launch pad for transcontinental settlement over the next half century. Local residents have long believed that in the early 1800s, fugitive slaves used parts of the old Kuskusky Path to make their clandestine journey north to freedom on the Underground Railroad. With the coming of the Industrial Revolution, and especially with the rise of steel towns throughout the Mon-Ohio Valley, remnants of the old Indian villages and the road that linked them disappeared. Modern municipalities and roads, and eventually the interstate highway system around Greater Pittsburgh, erased what remained of the trails of the once substantial Native American presence in western Pennsylvania. Without realizing it, present-day commuters on State Roads 18, 51, and 65 traverse portions of the once vital Kuskusky Path. Kevin Kenny, Peaceable Kingdom Lost: The Paxton Boys and the Destruction of William Penn's Holy Experiment (New York: Oxford University Press), 2009. Daniel K. Richter, Native Americans' Pennsylvania (University Park: Pennsylvania Historical Association), 2005. Paul A. W Wallace, Indian Paths of Pennsylvania (Harrisburg: Pennsylvania Historical and Museum Commission), 1971.